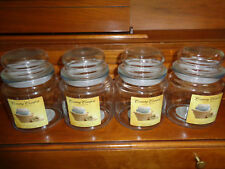 Lot Of 10 Recycled Clear Small Jars Perfect For Candle Making, Votives, Crafts. All are clean. We do our best to photograph and describe everything to the best of our ability. 6 Jars with lids per box. MADE In SPAIN. Includes 6 jars 6 lids 6 rubber seals per box. 3.5" tall glass jar (4.5' tall total with lid). See all pics for more detail and info. Choices include Gold, Gold Button, or Black plastisol SEALING lids suitable for canning or candle making. Also available are Rustic Bronze or Pewter NON-SEALING lids suitable for candle making only. 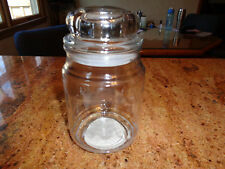 Set of 4 Jars With Lids that inset in jar. Lot of 4 Storage Glass Jars Lids Candle Craft Gift Craft Candle Making Christmas. Very Good to Excellent Condition. The lids do NOT have rubber gaskets. Each Jar has a lid. Available for sale is a lot of 24 (4oz / 118ml) "straight side" candle jars. Fits 3/1/2" jar opening with rubber/plastic gasket. 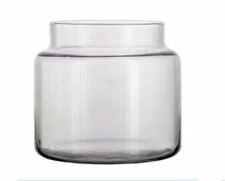 Cylinder Candle Jar (Yankee Candle) for crafts or storage. This is the jar only, no candle. This is a Yankee Candle Jar. Used and sold as is. Lot of 1oz Clear Frosted Boston Glass Bottles. Glass Droppers with Black Top Included. They would be good for craft storage or candle making. 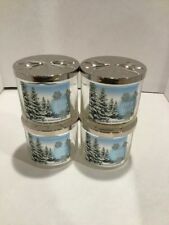 Lot of 3 BATH & BODY works empty large clear glass candle jars with lids 14.5oz. Each ......2 of the lids have embossed lines ...... there are alot of cool ideas on pintrest for these jars .....i cleaned out all the wax ...... from a clean and smoke free home !!!!! The base is solid and is about 1/2" thick. These originally had candles in them and are ready to use again. Empty Bath & Body Works Multi Color Coated Clear Candle Jars 3.5" Tall 4" D Lot. Empty Bath & Body Works Multi Color Coated Clear Candle Jars. 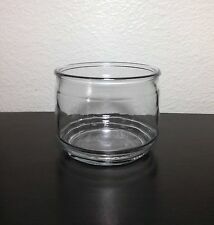 Clean, small glass candle jar holder with lid. No candle included. Mint condition! Tight rubber seal! Almost 4" tall. Available for sale is a lot of 72 (6oz) "straight side" candle/jelly jars. Available for sale is a lot of 216 (4oz / 118ml) "straight side" candle jars.